은 인왕산의 연봉들 아래로 넓게 펼쳐진 서대문 밖 경기감영(京畿監營)의 풍경을 12폭의 화폭에 담아낸 것이다. 전경은 부감법의 높고 넓은 시점으로 처리되어 있으며, 건물들은 오른쪽 위에서 왼쪽 아래를 향하는 사선방향의 평행투시도법으로 표현되어 있다. 이 작품에서는 산봉우리나 수목의 크기가 화면의 위쪽, 즉 공간상 뒤로 갈수록 크게 줄어들어 거리감을 지시해 준다. 그러나 색채면에서는 공간감이나 거리감을 그다지 의식하지 않은 듯 멀리 있는 산봉우리나 경물들이 흐리게 처리되어 있지 않다. 또한 이 그림에는 화면 전체에 상당히 많은 수목들이 그려져 있다. 원산에는 능선을 따라 소나무가 줄줄이 배치되어 있고, 중경과 근경의 나지막한 구릉과 집들 사이사이에도 여러 종류의 나무가 울긋불긋한 채색으로 풍성하게 묘사되어 있다. 이처럼 수목을 많이 그려 넣는 경향은 19세기의 일부 기록화에서도 제법 확인되는 바이다. 산은 피마준에 미점을 찍은 토산과 쓸어 내린 듯한 암산 등으로 묘사되어 있으며, 원경의 소나무 표현은 이의양(李義養, 1768∼? )의 기법을 연상케 한다하여 이 병풍도를 이의양을 비롯한 화원들이 그렸을 가능성에 대한 의견도 이미 개진된 바 있다. 병풍은 오른쪽부터 시작하여 1폭에 서대문［돈의문(敦義門)］과 수문장청(守門將廳)이 보이며, 제4폭에는 솟을대문에 기영(圻營)이라 쓰여진 것이 보인다. 제6폭 중앙에 있는 큰 건물은 관찰사가 근무하는 선화당(宣化堂)이며, 8폭 위쪽에는 영은문(迎恩門)과 모화관(慕華館)이 있고, 제8폭에서 9폭에 걸쳐 연꽃이 만발한 연지가 보이며, 제10폭의 위쪽에는 대현(大峴), 소현(小峴)과 읍승정(揖升亭)이라는 활터가 있으며, 그리고 제12폭에는 사정(射亭)이 보인다. 이러한 대표적인 건물 외에도 관아의 측간이나 작은 창고까지 묘사되고 사람들이 사는 기와집과 초가집들, 그리고 약방이나 신발가게, 쌀가게, 주막, 좌매 등도 배치되어 있다. 하지만 건물들이나 풍경묘사 보다도 이 그림에 활력을 부여하고 재미를 더해주는 요소는 바로 화면 곳곳에서 벌어지고 있는 생활장면이다. 이 그림이 문헌에 나오는 성시도(城市圖)의 형식을 빌린 것이라는 견해 또한 바로 이러한 산수도, 지도, 그리고 풍속화의 결합에 기인하는 것이다. 생활장면 중 가장 중요한 것은 물론 오른쪽으로부터 제3폭에서 제6폭 하단에 걸쳐 진행되고 있는 경기감사의 긴 행렬인데, 여기서 경기감사로 추정되는 말 탄 인물은 여타 인물과 달리 눈, 코, 입이 확연하게 그려져 있어 그 중요성을 말해준다. 이 행차에 참여한 진악대와 수종인물들, 그리고 이를 구경하고 있는 어른과 아이들 역시 현장감을 살려 표현되어 있다. 이 밖에도 건물에 딸린 마당과 큰 길이나 골목길 여기저기에는 다양한 포즈와 동작 중의 인물들이 묘사되어 풍속화의 좋은 예를 보여준다. 이를테면 소나무 밑에서 한가로이 쉬고 있는 갓 쓴 선비들, 자연스런 포즈로 잡담을 나누는 포졸들, 관아 앞에서 대기중인 말과 마부들, 물동이를 이고 가는 아낙네들, 동자를 데리고 말 타고 가는 선비, 가위 든 엿장수, 지게 진 인물들이 그려져 있으며, 그 밖에도 논밭에서 일하는 농부들, 새참을 머리에 이고 가는 아낙네들, 논두렁을 달려가는 개의 모습 등은 마치 당시의 실제 정경이 눈앞에서 펼쳐지는 듯 이 그림을 보는 이에게 실감나게 다가온다. 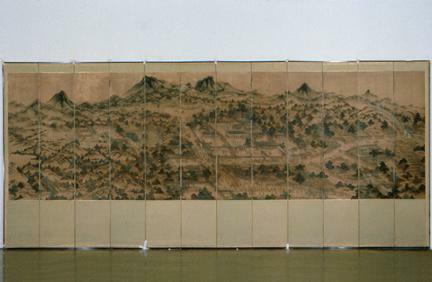 This 12-cut folding screen contains sceneries outside the Gyeonggi Provincial Office near Seodaemun Gate of Hanyang (present-day Seoul) in Yeonbong Plain near Inwangsan Mountain. The bird’s eye view method was adopted in making the piece. Buildings are portrayed in an angular, parallel perspective by an observer on a higher place on the right. This piece adopts the perspective technique in portraying faraway mountain peaks or trees, but that does not apply to the colors used. Faraway mountain peaks and other sceneries are portrayed in clear-cut colors. Many trees are contained in this painting. Pine trees are in rows along the ridges in faraway mountains. Diverse types of trees appear colorfully on nearby low hills and between houses. Such trend of including many trees was also followed in some documentary paintings of the 19th Century. The cut on the extreme right displays “敦義門” (pronounced Donuimun/West Gate) and “守門將廳” (pronounced Sumunjangjeong/ Guard Commander’s Office). The fourth cut from the right shows “圻營” (pronounced Giyeong/ Gyeonggi Provincial Office) on a tall gate. The large building at the center of the sixth cut is the governor’s office. The upper side of the eighth cut displays “慕華館” (pronounced Mohwagwan/ guesthouse where a welcome party was held for envoys sent by the emperor of the Ming Dynasty of China) and “迎恩門” (pronounced Yeongeunmun/ gate to Mohwagwan). The eighth and ninth cuts contain lotus ponds, with the tenth cut showing “大峴” (pronounced Daehyeon/High Pass), “小峴” (pronounced Sohyeon/Low Pass), and 揖升亭 (pronounced Eupseupjeong/an archery range). The 12th cut displays 射亭 (pronounced Sajeong/ archers’ pavilion). The piece contains even unimportant buildings like toilet attached to a government building, barn, roof-tiled or thatched houses of ordinary people, medicinal herb store, shoe store, rice store, pub, etc. The scenes of people engaging in everyday lives, portrayed here and there in this painting, add to its vitality. The most important thing among the everyday scenes is the procession of the governor contained in the third ~ sixth cuts from the right. The figure on horseback, presumed to be the governor, has his facial details like the eyes, nose, and mouth depicted, unlike the other people; thus indicating his importance. The band and attendants following the procession are portrayed realistically. The portrayal of the building courtyard, thoroughfares, back alleys, and people assuming various poses indicates a typical instance of a genre painting. It also depicts scholars wearing hats while taking a rest under a tree, police officers chatting with each other, horses waiting in front of a government office, women carrying jars on their head, scholar on horseback accompanied by an errand boy, yeot (candy) seller, people carrying an A-shaped wooden carrier on their back, farmers working in rice paddies and field, housewives carrying on their head lunch for their husbands working in the field, and dog running on a ridge between rice paddies.